There is plenty of sea in the Philippines, which I visited in 1989, curious about the origins of my other grandfather, who was born there in 1890. I visited three or four of the seven thousand islands which make up the archipelago, including Cebu, where Alfonso came from. There were dozens of Pimentel’s in the ‘phone book. But a temporary eye infection damaged my self-confidence and disenchanted me with the place. I was too shy to ring up total strangers and suggest that perhaps we were related. After all, it was 80 years since Alfonso had sailed away, never to return. He was the eldest son, and his father had expected him to prepare for a position of responsibility in their village. But Alfonso was deaf to his father’s wishes. He only heard the call of the sea. 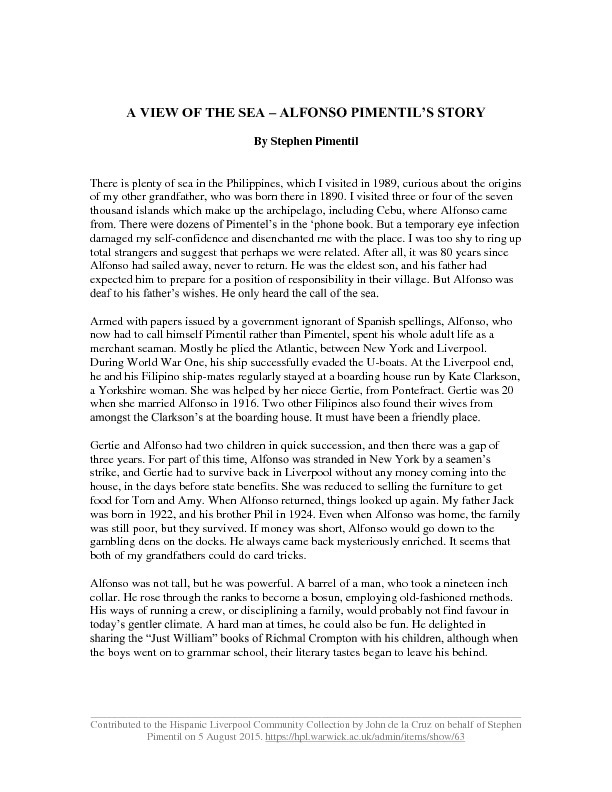 Armed with papers issued by a government ignorant of Spanish spellings, Alfonso, who now had to call himself Pimentil rather than Pimentel, spent his whole adult life as a merchant seaman. Mostly he plied the Atlantic, between New York and Liverpool. During World War One, his ship successfully evaded the U-boats. At the Liverpool end, he and his Filipino ship-mates regularly stayed at a boarding house run by Kate Clarkson, a Yorkshire woman. She was helped by her niece Gertie, from Pontefract. Gertie was 20 when she married Alfonso in 1916. Two other Filipinos also found their wives from amongst the Clarkson’s at the boarding house. It must have been a friendly place. Gertie and Alfonso had two children in quick succession, and then there was a gap of three years. For part of this time, Alfonso was stranded in New York by a seamen’s strike, and Gertie had to survive back in Liverpool without any money coming into the house, in the days before state benefits. She was reduced to selling the furniture to get food for Tom and Amy. When Alfonso returned, things looked up again. My father Jack was born in 1922, and his brother Phil in 1924. Even when Alfonso was home, the family was still poor, but they survived. If money was short, Alfonso would go down to the gambling dens on the docks. He always came back mysteriously enriched. It seems that both of my grandfathers could do card tricks. Alfonso was not tall, but he was powerful. A barrel of a man, who took a nineteen inch collar. He rose through the ranks to become a bosun, employing old-fashioned methods. His ways of running a crew, or disciplining a family, would probably not find favour in today’s gentler climate. A hard man at times, he could also be fun. He delighted in sharing the “Just William” books of Richmal Crompton with his children, although when the boys went on to grammar school, their literary tastes began to leave his behind. Come World War Two, Alfonso was only fifty, and was still on the Atlantic run. This time the U-boats were more successful. His ship, the S.S. Cortes, was sunk, near the Azores. Alfonso was luckier than most of his crew, and was picked up by one of the other ships in the convoy. But the U-boats struck again, the rescuing ship went down too, and Alfonso scrambled for the lifeboat. There was no second rescue. After a fortnight on the open sea, when the lifeboat finally drifted onto the coast of Galway, Alfonso, the last survivor from the Cortes, was still alive, but he was fading fast. He was taken to a local convent, where he was given the last rites. It is comforting to think that perhaps he had time to make his peace with God before he died. Thirty years later, my father drove us around Ireland on a family holiday. We went to Clifden in search of the grave. We found the convent, where my father talked with one of the older sisters, who actually remembered the ship-wrecked Filipino, but had never expected to see his son. She directed us to the graveyard, where we soon found Alfonso’s stone. A long way from Liverpool, and half way around the world from Cebu, nevertheless it is a fitting place for a sailor to come to rest. He has a fine view of the sea.